Could 2013 bear more than two phones from the ripening branches of BlackBerry? It's looking like that's an affirmative as the company's CEO earlier today said there's an upcoming flagship phone he's "very excited about." Speaking with CNET, Thorsten Heins teased, "There's one new product I'm really excited about, but I can't really share it. "It takes BlackBerry 10 to another level in terms of the user experience." A holly, jolly time of year? Heins said the new flagship will should be ready for the holidays, though he couldn't give a fool-proof guarantee. We are also likely to see a mid-year BlackBerry 10 device sometime this year too, though Heins didn't elaborate further. All told, the current fiscal year should welcome three to four BB10 devices. Perhaps BlackBerry is trying to make up for lost time? 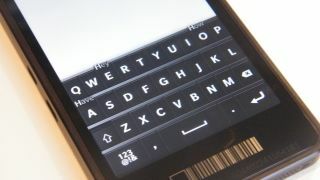 So far, the renamed company has announced the touchscreen Z10 and the QWERTY Q10, though the latter hasn't been released yet. The Q10 got an unlocked price today of £529.98 (around $800/AU$770). U.S. carriers begin selling the Z10 Friday, and Heins said he anticipates the Q10 launching to take place one or two months after its touchy sibling. As for the future line of BB10 devices, Heins said that ultimately the company would like to offer three levels of phone, with each tier offering both a touch-only and QWERTY option. Screen size dimensions for the phones won't change no matter what tier they're on. In addition celebrating BB10 and the Z10's U.S. launch, BlackBerry took time to acknowledge another important milestone today, and no it wasn't not having shut down yet. The company announced that BB10 customers now have over 100,000 apps to choose for their Z10 smartphones. Major names like Amazon Kindle, Open Table and The Wall Street Journal are now available, and others like CNN, The Daily Show Headlines, Maxim, MLB at Bat, PGD, Rdio and Skype are coming soon. Fan favorites Angry Birds Star Wars, BBC Top Gear news, Facebook, and WhatsApp are all in BB10's growing app circle, too. In 7 weeks, the catalogue grew by more than 30,000 apps, the company reported. BlackBerry must be using some kind of fertilizer...that or the Z10's U.S. launch provided some motivation to developers.